Cotton special occasion outfit sure to make any little man handsome. Fabric covered buttons and vertical tucks give this outfit a great look from formal to casual. Choose white or ivory and shorts or pants. Shorts and pants button to the shirt for a classic look. 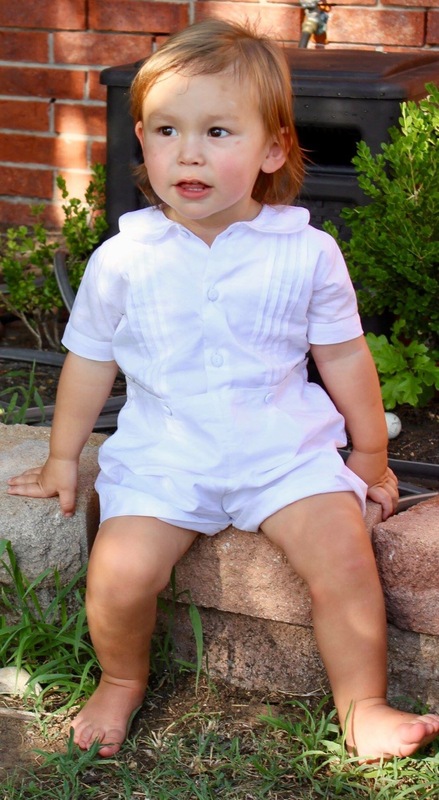 Size 3 month to 2 year include interior buttons on the pants for easy diaper changes. Sizing is based on loose fit. Pants and shorts have adjustable elastic waistband. 3 Month 7-12 LBS 18-23" 18"
6 Month 12-19 LBS 22-26” 19"
12 Month 19-24 LBS 26-30” 20"
2 25-32 LBS 32-36” 21.5"
3 30-36 LBS 36-39” 23"
Pairs great with our Virginia Lace Dress for ring bearers and family photos! We are extremely pleased with our grandson’s little ring bearer outfit! I love this store! We purchased this for my sons baptism! It was absolutely perfect! The fit was just right and the material looked so nice. We received so many compliments on how nice his outfit was. I recently purchased two of the classic boys outfit! The first outfit fit my nephew and the second one I was afraid would be too small by the time I needed it! I called and they went above and beyond to help me get my son the perfect fitting outfit! Love this precious outfit. I had to exchange my first one because it was too small for my big guy and the customer service was fabulous! We love Strasburg! I really liked the outfit but it was too small.